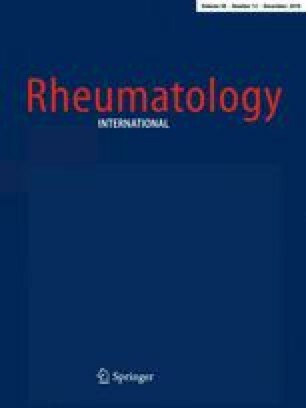 The aim of this study was to evaluate the efficacy of home treatment with mud compresses for the hands of patients with rheumatoid arthritis (RA). Forty-five patients suffering from RA were enrolled in a double-blind, randomized, controlled study. Twenty-two were treated with true mud compresses (treatment group) and 23 were treated with attenuated mud compresses (control group). The compresses were applied in the patients’ homes five times a week during a 3-week period. Patients were assessed four times: at baseline, upon completion of the 3-week treatment period, 1 month after the treatment, and 3 months after conclusion of the treatment period. Positive response was defined as reductions of 30% or more in the number of tender and swollen joints, 20% or more in physician global assessment of disease activity, and 20% or more in patient global assessment of the severity of joint pain. In the treatment group, significant reductions in the number of swollen and tender joints and patients’ global assessments of pain severity was observed at all post-treatment assessments. Significant improvement in the scores of physician global assessment was seen at the end of therapy and 1 month later. In the control group, no improvement in the number of swollen and tender joints or physician global assessment was found in any post-treatment evaluation. However, a significant reduction in patient global assessment of joint pain severity was reported at the end of therapy and 3 months after concluding treatment. Treatment with mud compresses relieves pain affecting the hands and reduces the number of swollen and tender joints in the hands of patients suffering from RA. This treatment can augment conventional medical therapy in these patients. This study was supported in part by a grant from the Ahava Company, Dead Sea Laboratories, Israel.